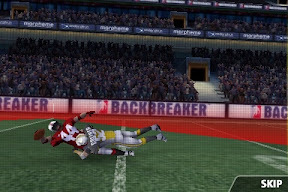 Backbreaker: Tackle Alley is definitely one of the best games I have played on my iPod... And one of the cheaper. At only 0.79€, and with a free lite version, this is definitely a must, at least for trying it. What's the point of the game? 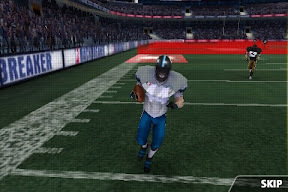 Running and avoiding rival tacklers until the touchdown zone. The interesting points? 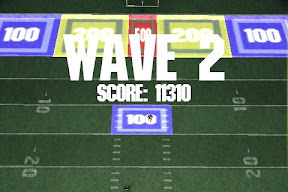 Smooth 3D playing, clever control system, rag-doll style animations and the usual Highscore systems, but with Facebook connect. 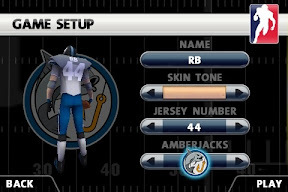 You start by creating your player: Name, number, skin color and team. Team names (and logos) are fictional, and you get more "teams" to suit yourself as you win challenges. You can play in two game modes: Challenge and Endurance. 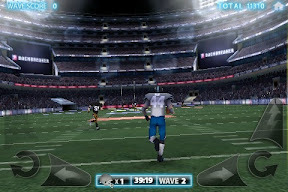 There are 6 challenges, each one with 10 waves of tacklers. Obviously they get harder as you play on.. 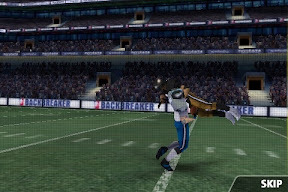 In each wave, rival tacklers go after you, and you have to avoid them while running to the opposing touchdown zone. Along the way, you can pass "score zones" (the blue, yellow and red markers in the ground, with 100, 200 and 500 written), and by dodging repteadly and quickly you get a score multiplier. The control system is plain easy, once you get used to it. To move: tilt. The lightning-like button on right: sprint, in the direction you are tilting. 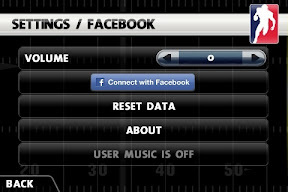 All other buttons (except the symmetric to the sprint, which is grayed out in this image) are feint buttons. 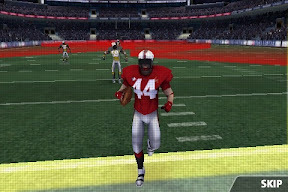 The arrows are juke moves, hoping in the direction of the arrow. The around arrows are spin moves, spinning in the direction indicated. Beware! 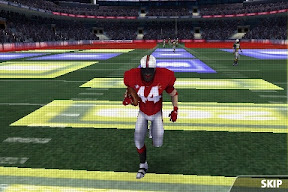 To correctly dodge you should NOT be sprinting. You can also dodge by tilting, but it is harder (and awards less points: 25 or 50). 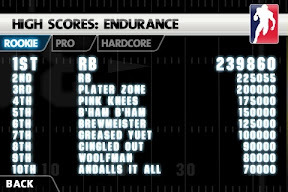 You get 150 by juking, and 250 by spinning around tacklers. 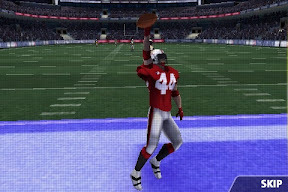 When you are free of rivals ahead, the grayed-out button appears, and you can start showboating (as depicted in the last three pictures above). 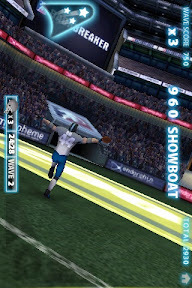 While you showboat, you get points (a lot if you still have a multiplier from dodging. 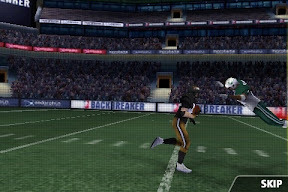 When you get tackled, you get a replay video... You can skip them, but they are really good (here comes the rag-doll like physics engine) and you can get a laugh at them, or a "d'oh", depending. 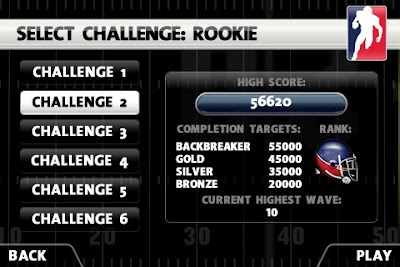 If you get past a set number of points for each challenge, you get a bronze, silver or gold helmet. 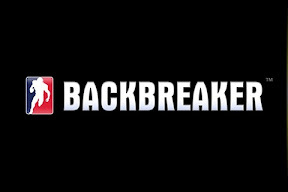 If you pass the last milestone, a "Backbreaker helmet". 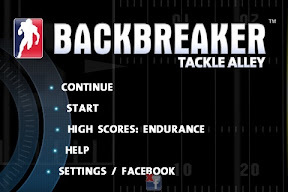 There are also separate highscore lists for each game type and level, and you can connect to Facebook (through the Backbreaker Facebook Application) to post your achievements to Facebook. Also, while loading you get some (scarce) tips.